The idea of ‘having it all’ is extremely appealing to me as a woman—after all, the thought of having a fabulous marriage, a great career, a growing family, and hobbies seems like the perfect life. Is work-life balance real? Can we really have it all? That’s what The Balance Project explores. Side note, really quick. Susie Orman Schnall is the creator of The Balance Project, a series of interviews with accomplished women discussing balance. In fact, the novel was based off of this initial project. 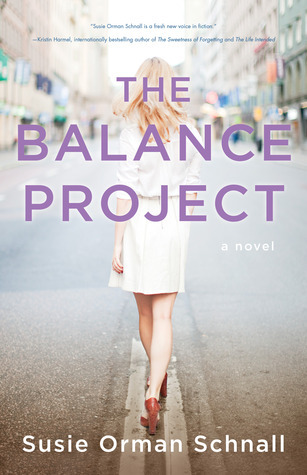 I first saw the project last year when I stumbled across an interview with Emily Giffin. I read several other interviews, but this was ultimately what made me request this novel. Now. On to the meat of the review, shall we? It’s told in first-person from Lucy’s point-of-view. Lucy is the personal assistant to Katherine, the badass leaning-in #ladyboss COO of Green Goddess. Lucy ended up in her position when she was denied the real job she wanted—a spot in digital media—but decided to get her foot in the door by taking the administrative spot. Three years later and she still hasn’t pursued a career in digital media, which turns out to be a big, ugly cloud hanging over her head for the duration of the book. After Katherine stabs her in the back, Lucy turns around and does the same thing. You see, Katherine only seems to have it all. Her perfect facade doesn’t reveal that she doesn’t get to see her kids that much, that her sweet husband is considering leaving her, and that her life is completely chaotic and out of order. It was kind of like a nicer version of The Devil Meets Prada. Because Katherine isn’t really devilish—she’s just kind of selfish. On the other hand, marriage-phobe Lucy is also realizing her work-life balance is, well, unbalanced. Long hours and constant canceled plans have placed her own relationship with her hunky boyfriend Nick on the rocks. As a main character, I liked Lucy. I could sympathize with her for the most part, though I did find her to be a bit of a spineless sissy much of the time. For a while, it was humanizing. After a while, it became whiny. However, her realistic musings and characteristics kept me not annoyed with her. And though I have a weakness for sugar- and fat-laden coffees and processed food-like products made mostly of partially hydrogenated oils and ingredients I can’t pronounce, in my heart of hearts I was a health nut. Or would be someday. That’s me to a damn T.
I think I sympathized the most with Katherine—she puts her career first. She wears that ‘I’ve got it all figured out’ facade. That is, until everything else spirals out of control—including her balance. The underlying theme of the book was, surprise, balance. It was kind of like a self-help book wrapped up in a novel, which I really loved. It definitely had some great underlying messages and strong females (though I wish Lucy had been a little bit stronger). If anything, it weirdly makes me want to move to New York to get a career in something. Just because it sounds nice. And do they really have oversized bagels on every corner? Overall, I loved this book. I rated it a 4/5 on Goodreads and would definitely recommend to those who enjoyed The Devil Meets Prada, Emily Giffin, and Lean In. I received this book from NetGalley and SparkPress in exchange for an honest review. Thank you!